This Oh! Nuts Gift Box has a selection of twelve (12) perfect snack foods, able to be enjoyed by those who are vegan or on a restricted diet or dairy intolerance and low in sulfate. Heart-healthy and packed with nutrients, the healthy snack options in this box will promote the best of health. Looking for a great Holiday corporate gift to send? This healthy gift choice shows your commitment to quality gift-giving AND to healthy living. Want to send your loved ones a Hannuka or Christmas gift that brings good cheer and good health? Anti-oxidant fruit and protein-rich nuts give your loved ones quick munching foods that are good for them. We stand by our product. Oh! Nuts selects the best and freshest ingredients to assemble our high-quality Holiday gift baskets. The snack foods in this gift box are sure to be enjoyed down to the last nibble. And, yes, all our products are certified Kosher. Health – whatever language it comes in (santé, здоровье, 健康, בריאות, Gesundheit, स्वास्थ्य), it finds its perfect Holiday expression in this generous Christmas, Holiday, Thanksgiving, Valntines Day, Mothers Day or Fathers Day gift basket from Oh! Nuts. Contents of this Oh! 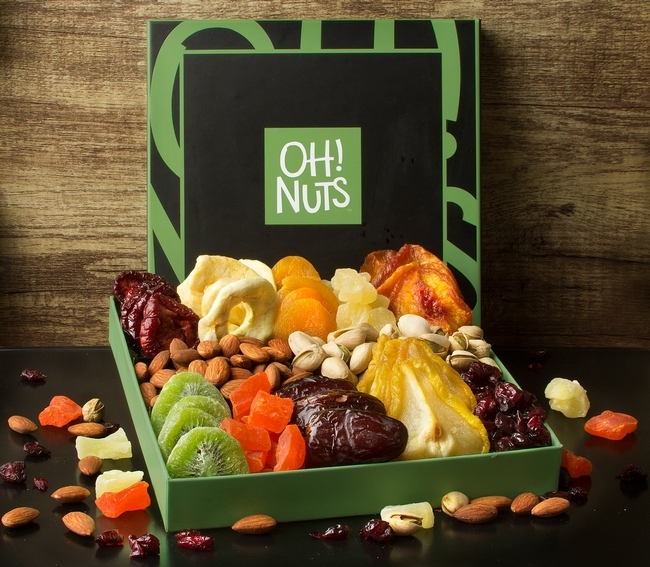 Nuts Handsome Gift Box: Nectarines, Pineapple, Turkish Apricots, Apple Rings, Plums, Cranberries, Pears, Large Plumpy California Dates, Sugar Papaya, Sweet Kiwi, Roasted Almond and Pistachios. Delicious gift giving made healthy. Cheers to healthy holidays! Nuts are a great source of nutrition, and that is especially true for unshelled nuts. 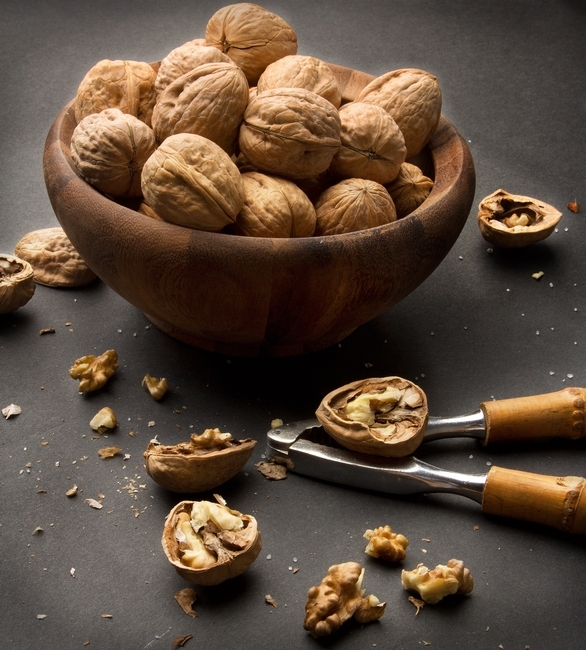 Walnuts are one great example, offering considerable protein, dietary fiber, Omega-3 fatty acids, and more. If high cholesterol is an issue for you or a family member, you’ll be gratified to learn of yet another benefit – lower LDL and total cholesterol. Get 1 lb. of walnuts in shell, just as nature made them, and you get the unadulterated benefits. Whole walnuts are always available at Oh! Nuts, and so are whole nuts in shell of other kinds. Order in bulk so you can bake with them too. That way you can enjoy their great taste in other ways while continuing to maximize their healthful benefits. Eat the delicious fresh roasted salted cashew nuts from Oh! Nuts by themselves as a snack, mix them with other nuts or use them to create your own trail mix. They also taste wonderful on top of yogurt and in desserts such as cookies and breads. These cashews are freshly roasted to perfection to create a subtle and delectable taste. They’re also lightly salted to bring out the flavors. Eating cashews provides an array of health benefits as they are high in vitamins, minerals and antioxidants. 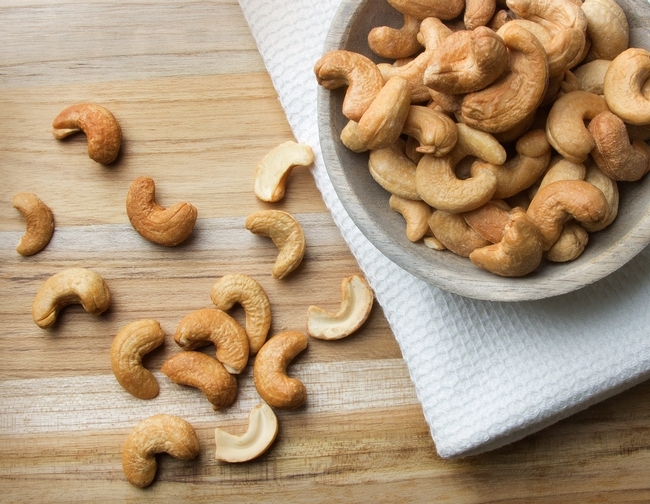 Our fresh roasted cashews are low in cholesterol and have no added sugar. They’re also high in protein to keep you feeling full for longer. Indulge in a sweet treat that is actually great for you with a batch of California mixed fancy dried fruits from Oh! Nuts. You’ll almost be able to taste the sun-drenched warmth that ripened these delicious California fruits before they were dried. 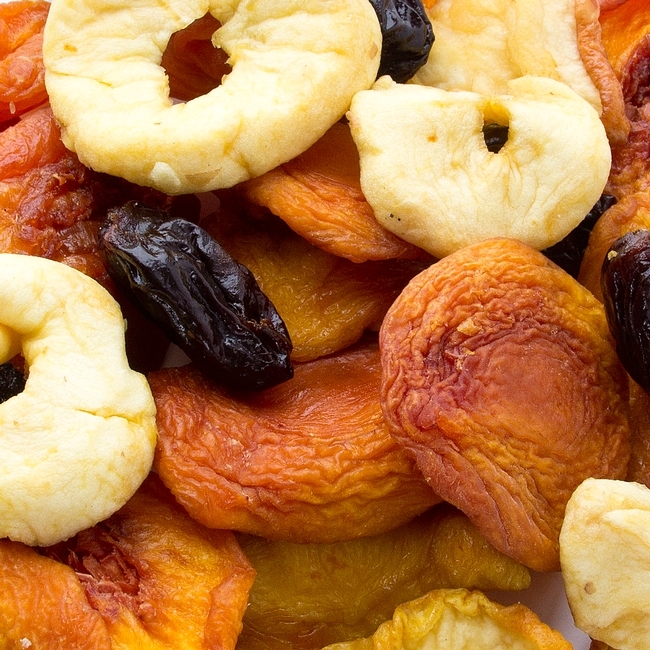 This fancy dried fruit mix includes peaches, apricots, apples, prunes and pears to create a tasty snack that’s perfect for sharing. Every fruit in this California mixed is harvested and dried at peak ripeness to ensure that you’re getting the freshest and best-tasting product every time.In addition to containing vitamins, minerals and antioxidants, this dried fruit is low sodium, low cholesterol, low fat, no sugar added, dairy-free, egg-free and kosher. Do you want to send a gift basket that is healthy and ideal for those on restricted diets? This Oh! Nuts Wood tray gift box has twelve sections, each one filled with protein-rich snack foods. Premium gourmet nuts and seeds are featured in a wide variety. 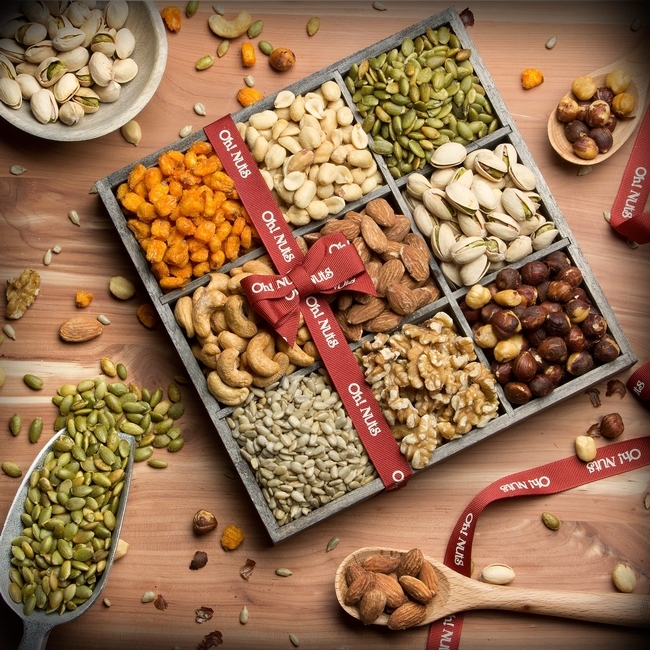 The delicious nuts and seeds in this charming gift box make this a super healthy gift basket. Nine (9) different varieties of nuts and seeds For variety is the very spice of life, and we want to give you options in your Holiday snacking. his nut-filled gift box has a nut for every family member’s preference. To give variety in taste that matches the variety of your guests. Sizing matters. Oh! Nuts always selects the biggest nuts in the market. When nuts are sorted in nut processing plants, Oh! Nuts has become known to only buy the largest and freshest grade nut.